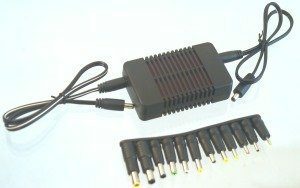 12V or 24V input DC/DC converter with wide range input, up to 34V volt to 3V, 4V, 5V, 6V, 7V, 8V, 9V, 10V, 11V, converters with adjustable output for use in 12V and 24V systems, up to 5 amps output in stock. 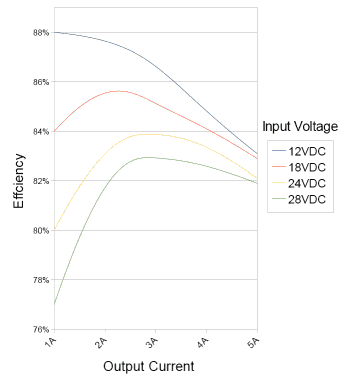 Very reliable, inexpensive switchmode, regulated DC/DC converter adjustable to various voltages between 1.5V and 11V. Maximum 5 Amp output. This is a single output DC/DC converter with barrel connectors for input and output. Input voltage up to 34 volts. It is adjustable by an externally accessible potentiometer between 1.5V and 11V as long as the input voltage is at least 0.5V higher than the output voltage. These switchmode voltage reducers can power a wide variety of DC input products from 12 volt and 24 volt trucks, heavy equipment, and aircraft cigarette lighter power points. 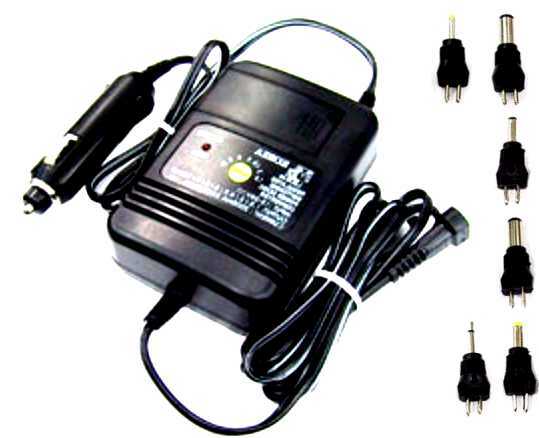 These are used by original equipment manufacturers to power their devices whenever 24V to 34V is available, and a reduction in voltage is required. It is an easy way to make your equipment mobile. 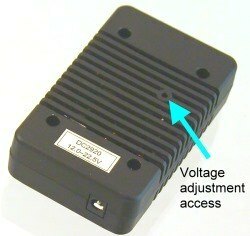 The PST-DC2920L DC converter works fine in either 12 volt or 24 volt vehicles. The two included cables are identical, with a 5.5x2.1mm barrel plug on one end and a 5.5x2.5 mm barrel plug on the other end. The cables are 16AWG zip cord and 20 inches long.